White paper on crime 2004 Part5/Chapter3/Section1/1. Section1 Worsening prison overcrowding:What condition is referred to as overcrowding? Japanese prisons are faced with worsening overcrowding,with the actual number of prison inmates surpassing the imprisonment capacity.This section overviews the trends in accommodation of convicted prisoners and examines the current situation of prison overcrowding. Statistical data on imprisonment capacity separately for convicted prisoners and defendants awaiting trial has been available since1972. Fig. 5-3-1-1 and  show the imprisonment capacity and the number of convicted prisoners at the end of each year since1972,and the occupancy rate of capacity for convicted prisoners. Fig. 5-3-1-1 shows the number of convicted prisoners at the end of each year in the post-war period. The number of convicted prisoners declined during the1955-1974period after the rapid increase during the period of post-war chaos,and fell below38,000in1974and1975.Subsequently,after showing moderate rises and falls,it stayed at a low level of about37,000from1991to1994.Then,it started to increase significantly in1995,and has continued rising to date.In particular,it has increased by2,000to5,000annually since1999,reaching61,534at the end of2003.The number of convicted prisoners at the end of the year surpassed60,000for the first time in43years,since1960. The imprisonment capacity for convicted prisoners stayed within the range of46,000to49,000since1972.However,it surpassed50,000for the first time in2003,increasing by3,474from the previous year to52,783. The occupancy rate of capacity for convicted prisoners remained below100%for a long time since1972and stayed below80%from1991to1995.However,it started to increase significantly after1996,surpassed100%for the first time in2000and reached116.5%in2002(up by37.5points from1995).The rate at the end of2003was almost the same as the rate of the previous year,116.6%,because the increase in the number of convicted prisoners was covered by an increase in imprisonment capacity. As outlined above,the number of convicted prisoners has been increasing rapidly since1995and the occupancy rate of capacity also well exceeded100%accordingly.Thus,the recent situation of imprisonment of convicted prisoners is the worst in the past30or40years. For reference, Fig. 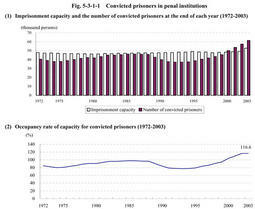 5-3-1-2 shows the post-World War II trend of population in penal institutions of convicted prisoners and of defendants awaiting trial during the post-war period.The occupancy rate of capacity of those two types of inmates combined have declined after once reaching a peak during the period of post-war chaos and stayed below100%for a long time since1967.However,it surpassed100%in2001for the first time in35years and reached105.8%in2003. Fig. 5-3-1-3 and Table 5-3-1-4 show the imprisonment capacity,the actual number of inmates,the occupancy rate of capacity,etc.in individual prisons,branch prisons,and juvenile prisons at the end of2003. The occupancy rate of capacity surpasses100%in almost all prisons(64out of72prisons)and in particular,29prisons were operating at over120%of their capacities.About half of the prisons where the occupancy rate of capacity is below100%are medical prisons,which are required to operate below their full capacity in order to deal with sudden illness of other prisons'inmates.